Which Paid Traffic Method is Right for Your Business? There are two overarching ways to increase the amount of traffic your website receives. Organic methods, such as content marketing and search engine optimization can work wonders for companies willing to play the “long game,” or those who don’t need to generate traffic right away. For companies looking to increase traffic now, however, the paid traffic route is definitely the way to go. As we’ll discuss throughout this article, the main benefit of paid advertising is that it allows your company to generate visibility immediately (as opposed to the organic methods that typically take a while to gain traction). The trade-off for paid advertising is…you have to pay for it, but this doesn’t mean you’ll need to break the bank – and it doesn’t mean you should just indiscriminately throw money at your ad campaigns. While you’ll invest a decent amount of cash into these paid initiatives, you want to be sure that you’re only investing as much as is necessary to generate the results you’re aiming for. In this article, we’re going to discuss the three paid ad methods that are generally considered to be the most effective for generating new traffic to your website. Before we dive in, though, let’s quickly go over the pros and cons of paid advertising in the first place. Formerly known as Adwords, Google Ads is a pay-per-click advertising service that enables you to gain visibility on the most-used search engine in the world as well as its network of ancillary websites. Needless to say, becoming visible on Google can be huge for your business. A presence on Google Ads can increase brand awareness for a company by as much as 80%. This stems from a 2014 study in which consumers were asked which brand first came to mind after being provided a related keyword phrase. Participants mentioned the brand that appeared as the top paid search result 80% more often than the brand appearing organically below the paid ad. Consumers using search terms that indicate a high intent to make a purchase account for 65% of the clicks received by paid ads. In other words, 65% of those who click on your paid Google Ads are actively looking to do business with you. The average ROAS for a Google Ad campaign is 2:1. That said, even if you’re currently operating on a strict budget, investing in advertising on Google is worth every penny. Don’t just take our word for it. Take a look at this case study of Turkish rental car company Garenta’s experience using Google Ads to generate brand awareness and spur business growth. The company’s efforts paid off in spades. Once Garenta began using Google Ads, half of its subsequent web traffic came from individuals who engaged with its ads. Additionally, those who engaged with the company’s Google Ads were accounting for 40% of its conversions. The key part of that statement is “the right (Google Ads) strategy and ongoing optimisations.” Google Ads (or any method of paid ads, for that matter) isn’t a quick fix, nor is it a silver bullet for driving traffic. If you can nail your Google Ad initiatives from the get-go, you should easily be able to recoup your initial ad spend – and begin ramping up your campaigns – in no time. While social media provides several opportunities for companies to engage with their target audience members organically, brands can also pay to generate visibility on these platforms, as well. Amazingly, over three billion people have at least one social media account registered to their name – with eleven people registering for a new account every second. More importantly for our purposes, the major social media platforms (such as Facebook, Instagram, and Twitter) are chock-full of individuals looking to engage with their favorite brands (as well as new ones). According to a study conducted by Adobe, half of social media users from Generation Z – and 42% percent of Millennials – view social media as the most relevant channel for ads. Along with this, 59% of all social media users log onto their platform(s) of choice for consumer-related purposes. Finally, social media ads drive three times as many non-customers to a company’s website than current customers; in other words, your social media ads are three times more likely to reach brand new customers than to simply re-engage current ones. As far as your choice of platform goes, you have a number of options. Additionally, each of these platforms provides a variety of ways for you to create content specifically to be used for advertising purposes. Let’s take a look at each in a bit more detail. With over 2.2 billion monthly active users, it’s almost guaranteed that individuals within your target audience are scrolling through their Facebook feed at pretty much any given time. 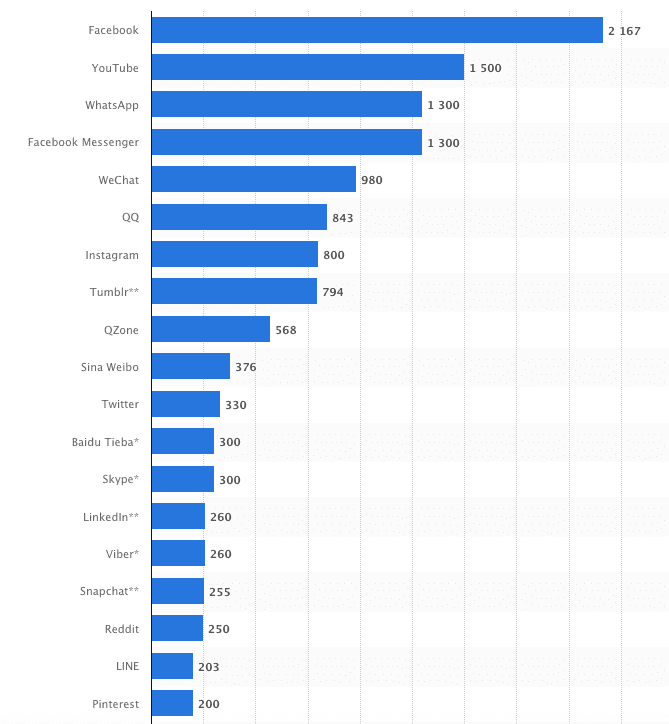 Compared to Instagram (which we’ll get to in a moment), Facebook’s cost-per-click is relatively cheap, hovering around $0.97 worldwide. Companies operating on a budget may want to consider Facebook as a frontrunner for their social media advertising initiatives – especially when you consider the sheer size of the audience they’re bound to reach through said campaigns. That doesn’t necessarily mean you should avoid advertising on the platform altogether. 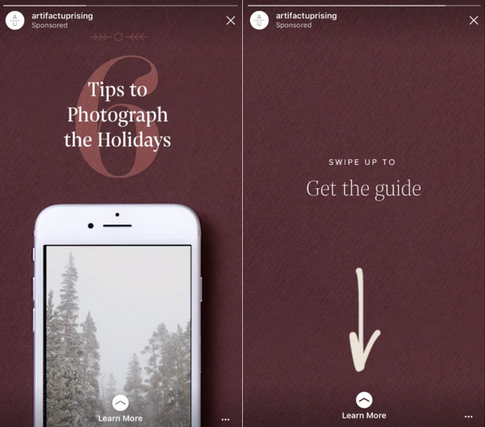 Considering that over 200 million users use the platform specifically to engage with brands on a daily basis (with two-thirds of these individuals engaging with companies that are new to them), Instagram provides major opportunities for your brand to gain visibility and generate new leads. While photo ads are typically the cheapest option, in terms of “bang for your buck,” carousel and canvas story ads reign supreme. Founder of fitness company Bikini Body Guide, Kayla Itsines, saw a 21-point lift in brand awareness after creating a series of video carousel ads – equating to her brand being exposed to over 6.4 million new audience members. Subscription box service Birchbox used canvas story ads to target consumers in France, leading to a CTR that was four times higher than the company’s average – at 50% of the CPC of its other Instagram ad campaigns. Again, while advertising on Instagram may cost you a bit more upfront, the returns you’ll see from a well put-together campaign will easily make it all worth it. Though Twitter isn’t nearly as popular nowadays as Facebook, Instagram, and a number of other social media platforms, it still provides some valuable opportunities to companies in terms of advertising potential. According to data collected by CNN, while US Twitter usage continues to decline, the platform still boasts a worldwide audience of 328 million – most of whom are likely to make purchases from brands after following them. Add to this the fact that those who use Twitter are typically active and avid users of the platform – meaning they’re highly engaged and primed to take action – and you have a clear case as to why you should definitely consider advertising on the platform in the near future. Know which platforms your target audience is most likely to use – and focus on optimizing your presence there. At the same time, make sure your brand “fits in” on a platform before diving in. When promoting actual content with your ads, go with that which has generated the most organic engagement among the audience you’re currently targeting. What may have at one point seemed like a soon-to-be-fading trend is now the most effective way for companies to spread brand awareness and grow their customer base. If that’s not enough to convince you that you should hop on the influencer marketing bandwagon (if you haven’t already), it’s also worth knowing that more than half the brands that use influencer marketing say the tactic brings in more valuable customers than their other marketing initiatives. Take the story of online mattress retailer Leesa’s experience with influencer marketing, for example. Faced with the inherent obstacle of not being able to allow potential customers to “try before they buy,” Leesa decided to get in touch with a number of influential content creators within the sleep-related industry and send them a free mattress in exchange for a blog post centered around reviewing the product in question. The positive social proof generated from the overwhelmingly positive reviews written by these influential individuals led over 100,000 people to click over to Leesa’s website – eventually leading to over 400 sales being directly attributed to the influencers’ recommendations. When partnering with influencers, you need to be 100% certain that the partnership doesn’t appear phony or out-of-place in the slightest. The fact is, a mere 3% of consumers trust endorsements from celebrities simply because they’re well-known individuals. Look to partner with individuals who would actually want to engage with your brand, all business aside. Not only will this allow you to work together to generate authentic content, but it will also allow you to tap into a new audience that will actually be interested in what you have to offer. Remember: the goal isn’t just to widen your reach; it’s to widen your reach to consumers who will become paying customers in the near future.